Our recent trip to Chobe was a five day stay. April is in-between season, still warm with rain, but the evenings were starting to cool down. The clouds provided some wonderful drama to our landscapes and sunsets during the first few days. By Saturday, our second last day, it had become very overcast and dark, curtailing our photography on the boat. There was also a lot of wind which the animals do not like. The wind disrupts their senses making them much more cautious and birds seek shelter from the gusting wind and rain. By afternoon it was raining so we did not go out on the boat and it was still raining on the Sunday morning. Usually when the weather is like this we retire to a convenient place to edit our images and chat amongst each other, which is great fun. The rain was intermittent, stopping allowing the light to brighten at times. It was amazing to see the amount of wildlife living in and around the lodge which came out to play as soon as the rain stopped. There was little active bird life, but the animals were busy. 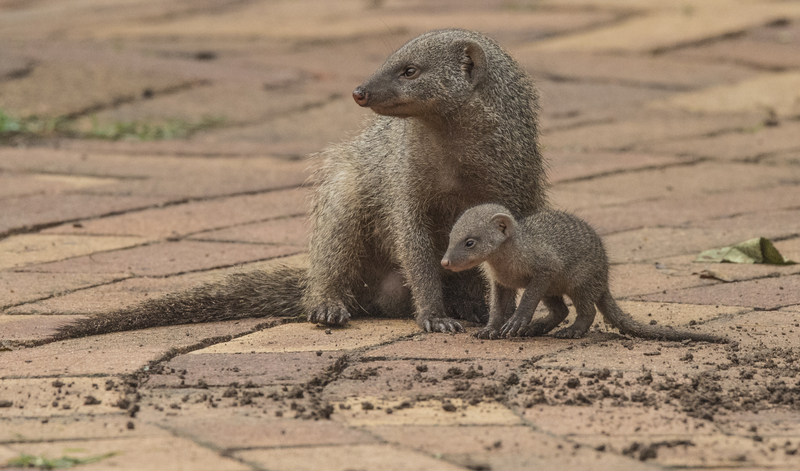 A large family of banded mongooses lived in burrows under some of the lodge’s rooms. They came out to play and forage once the rain stopped. 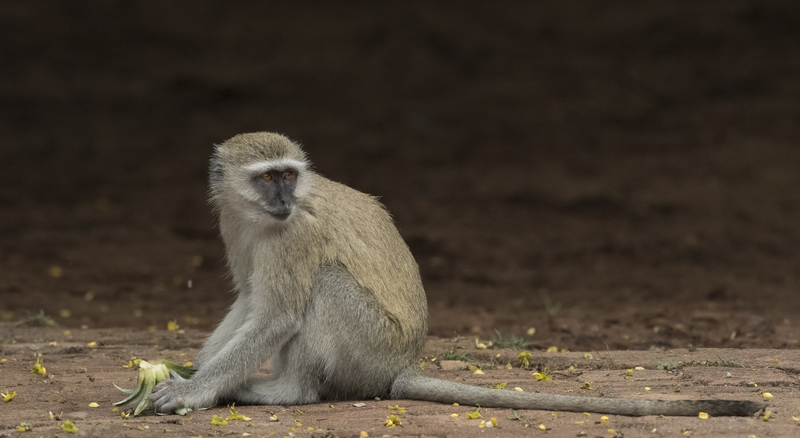 A warthog family also came out to forage on the lush lawn in front of the rooms, and Vervet monkeys were always around the lodge trying to steal food from the dining area and from visitors’ rooms, if unsuspecting visitors left their doors open. The baboons also trooped across the lawns, ever the opportuntists, and we were graced by a beautiful, dainty bushbuck doe which surprisingly emerged from behind a wooden fence. One thing I have learnt from wildlife photography is that the weather and lighting might change but new unforeseen photographic opportunities present themselves for those who are willing to wait and watch. 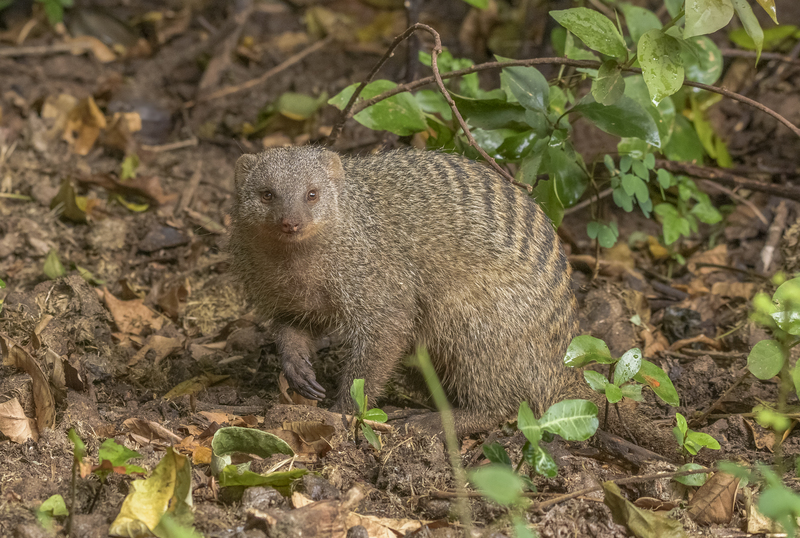 I cannot tell you how many times I have been in the bush and seen Banded Mongooses but never been able to photograph them up close. Despite the “grotty” weather this opportunity opened up. In wildlife photography when there is such changeable weather, “it is never over until it is over” and expect the unexpected. 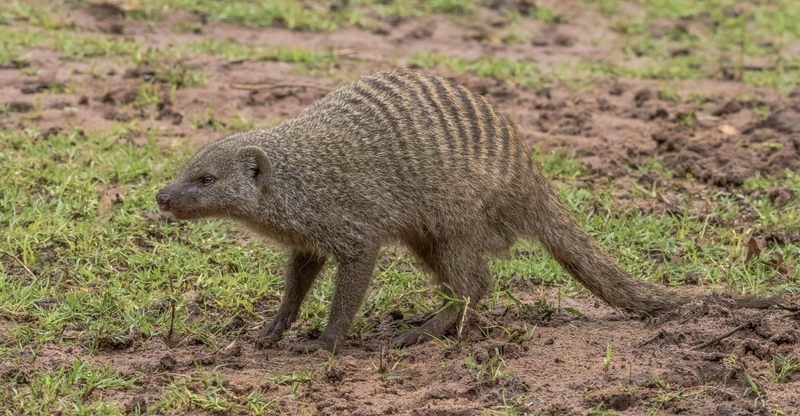 The banded mongoose has bands of fawn hair on its back. This was the alpha male in the pack – there is usually only one. 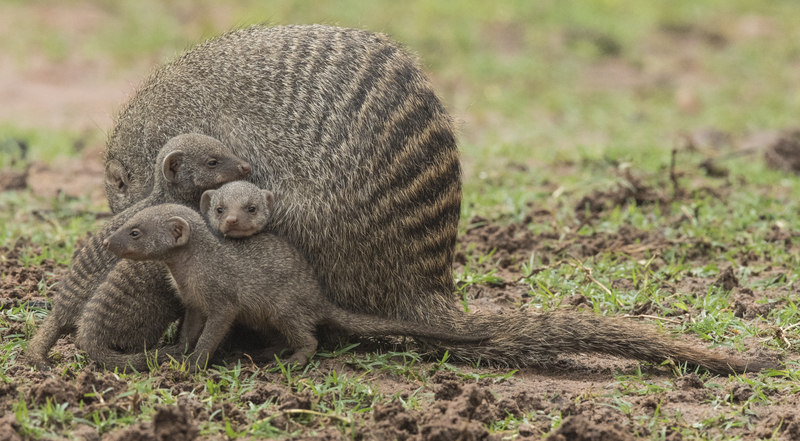 A pack of banded mongooses can swell to 40 individuals. Rudyard Kipling never described what type of mongoose Rikki Tikki Tavi was – but he was a valiant young Indian Mongoose. Mongooses eat everything from beetles and grubs to snakes. They seem to be fearless when tackling a venomous snake. 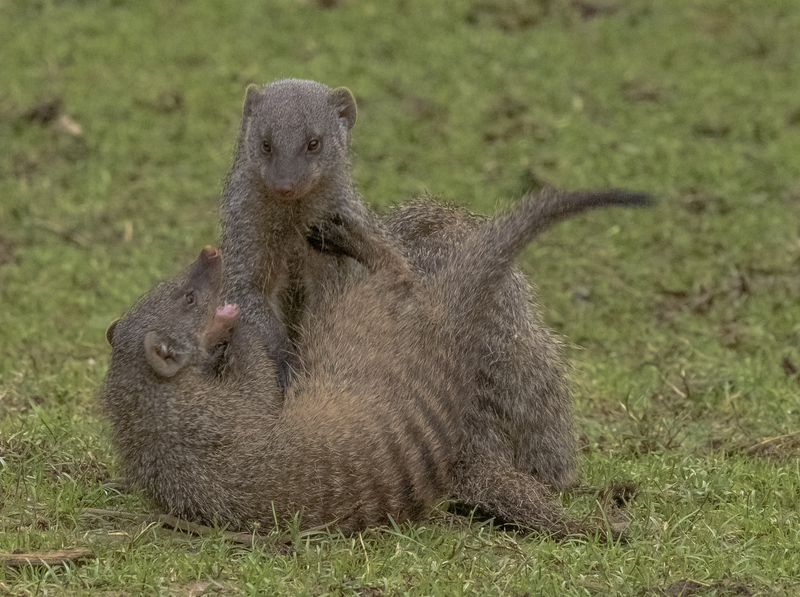 Banded Mongooses live in permanent and cohesive large packs. They are very sociable and talkative creatures. They live in woodland savanna areas where they can find beetles, insects and smaller reptiles. The lodge seems to provide them with a wide variety of these edibles. Like many bands of animals they form nurseries where a few adults look after the nursery of youngsters while the other adults go off to forage. Usually the births are synchronized and all pack members help to look after the young. Breeding is normally restricted to the rainy season, and during her life time a female averages three litters every two years. 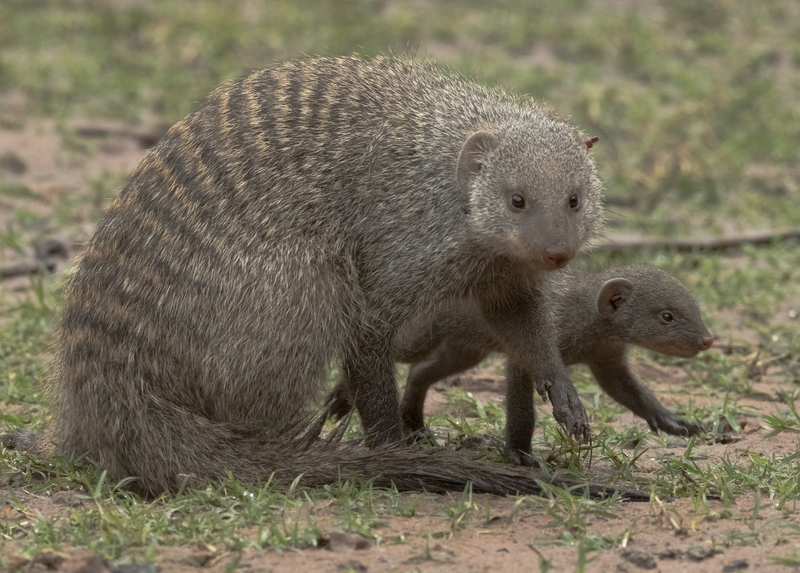 Banded Mongooses are a tasty snack for predators such as cheetah, jackal, leopards and young lions. The young were very small and still “tottery” on their little legs. They always stayed very close to their attendant adult. 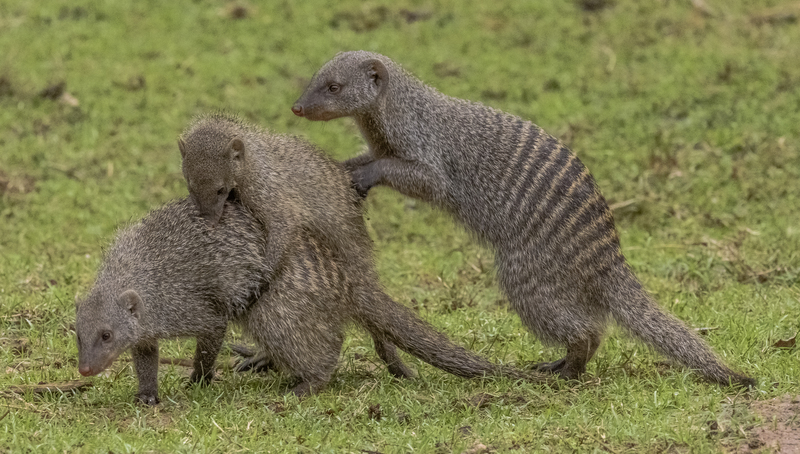 Banded Mongooses work together in groups to fend off predators, mainly to make the group look like one large mobile creature. The key objective being to protect their young and elderly. Sounds like humans could learn an thing or two from our little band of friends. As cute as many of these animals look they are wild. 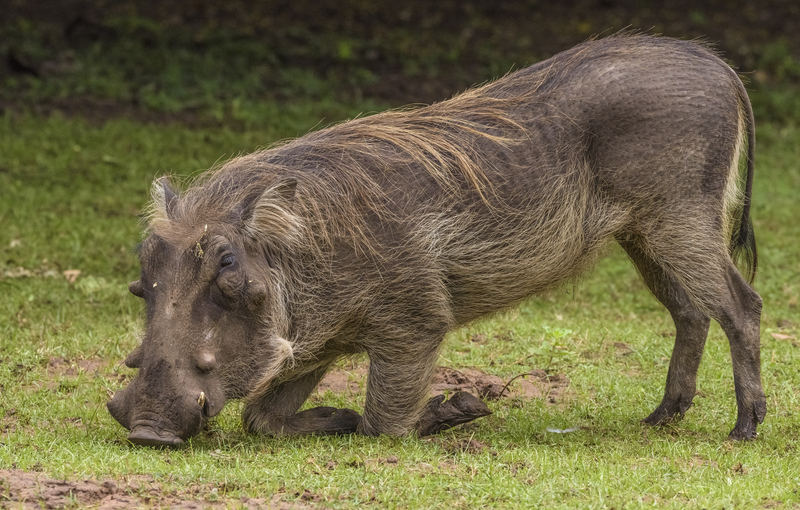 The warthog’s tusks are there for a reason and are known to rip open the belly of a lion, they are not for show. This boar had particularly small tusks, I am not sure why as he looked fully grown. 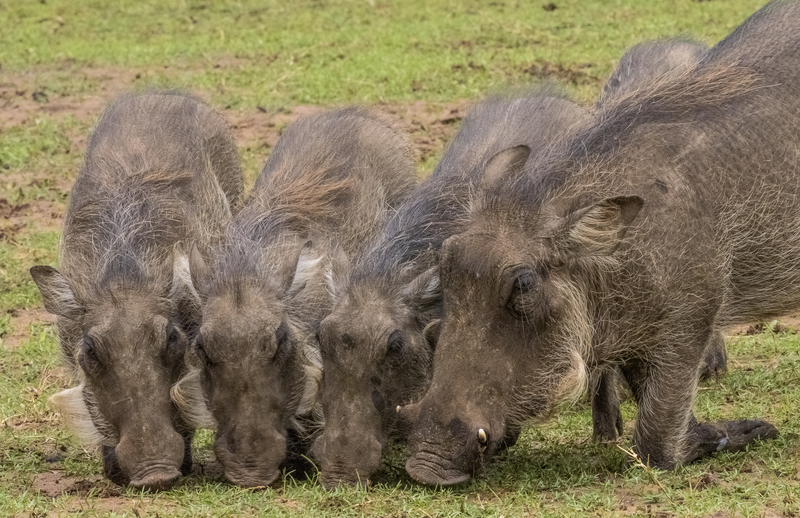 A warthog sow with her brood, kneeling and grateful for the easy, protected, abundant food. These youngsters had major whiskers. 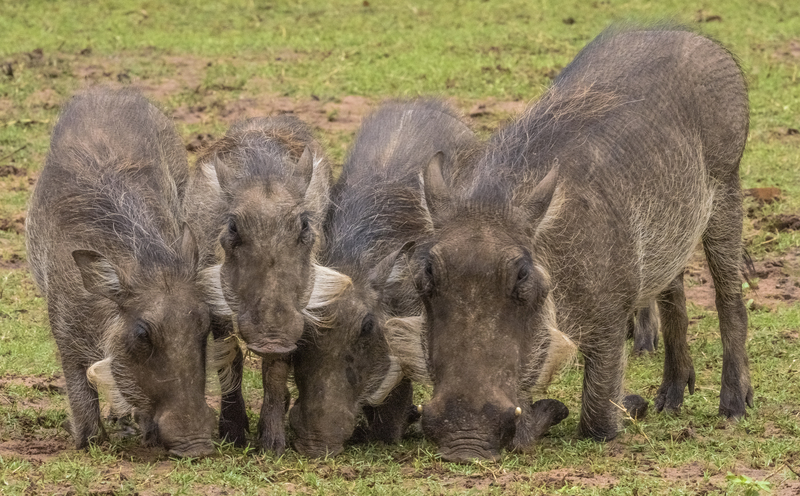 In fact, this warthog family were the hairiest I have ever seen. From behind the wooden fence emerged this beautiful young bushbuck doe. Bushbuck are normally elusive and they are browsers so it was quite a surprise to see this delicate bushbuck emerge. She seemed quite habituated to all the people milling around. Bushbuck are active around 24 hours a day, but tend to be nocturnal near human habitations. 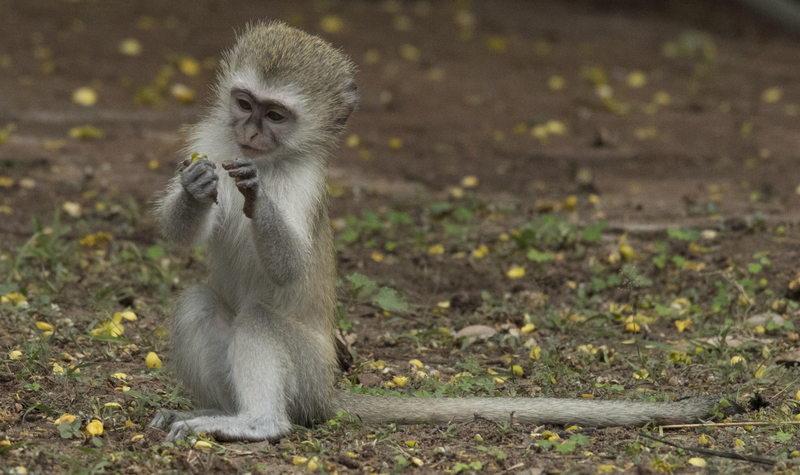 Vervet Monkeys are certainly habituated to people, in fact they thrive on human’s casualness, the more distractions, the better. Nevertheless, there is always a scout up in the tree watching for predators or lodge guards with catapults. 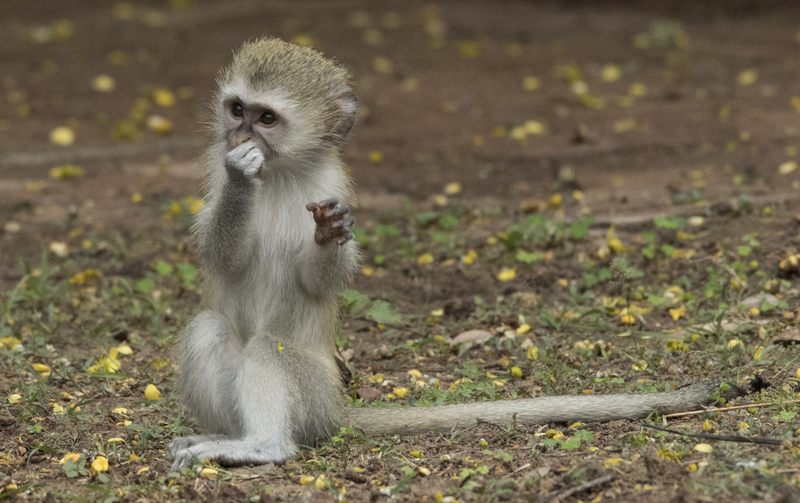 Vervet’s main predators are Martial Eagles, pythons and leopards. They have different alarm calls for each. I am not sure what the alarm call is for a guard with a catapult. 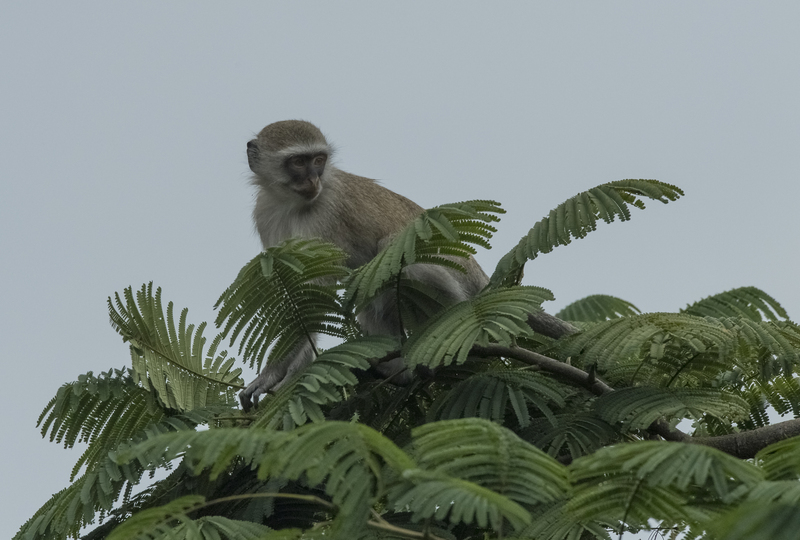 There were many Vervet’s running back and forth. Invariably they found something to munch on, in some cases stolen from the buffet at the dining area. 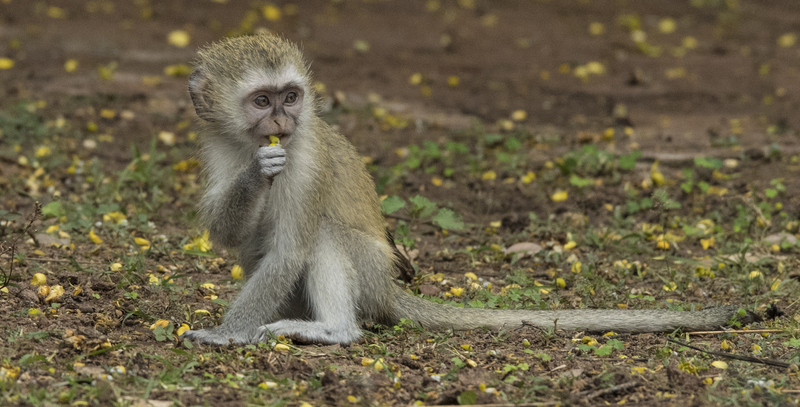 This very small youngster caught my eye, as curiosity overtook naiveté. I could not get over how human-like many of its expressions were, especially those hands!!! I hope these few images show that if you keep your eyes open and your camera ready there are always opportunities regardless of the weather. The wildlife was prolific around the lodge as is usually the case because there is plenty of food. We were at the Chobe Safari lodge for a photographic boat safari but mother nature often has other plans. The trick is to go with the flow and keep your eyes open and camera ready for opportunities and they will come, whether you expect them of not. A special thanks to Johan Brits who was our CNP guide – it was a wonderful trip. Thanks also to Kwana for driving the boat and getting us into and out of the most amazing places. I have enjoyed your photographs – as always.